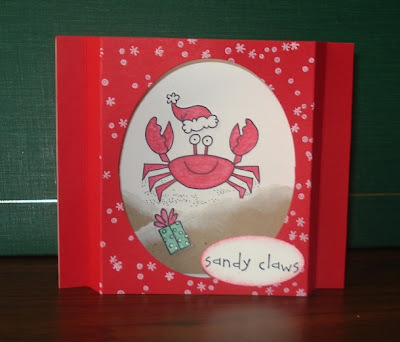 Craftin' Caro: Next Xmas card camp - Wed August 27! Next Xmas card camp - Wed August 27! Now that my holidays are over with, I just wanted to drop you all a quick "hello!" plus share a reminder about this Wednesday's final summertime 5 card Xmas class. I've had a great time this summer getting the jump on my massive holiday card "job", and it seems that everyone who has attended the card camps (or bought them "to-go") would agree. Here is one of the cards we will be making Wednesday night, CASE'd off a card I swapped at Convention with Kim Vale, a demonstrator from Stoughton, WI. Don't you just love "Sandy Claws"? :) It has a fun and unique shape that would be a joy to receive... and we'll have even more fun making it!! I've been busy planning out my calendar for the next few months, so I've just updated my classes & events page to include ALL my events between now and the end of November. Anyone in or around the Toronto area is welcome to come and check them out! **NEW** If you're a demonstrator in our Canadians, INK!" group, I now have a page just for you guys HERE, that reflects your discounted class fees, etc. p.s. If you live in Canada, don't forget to sign up for my free e-newsletter (on the left-side). There's a fantastic special coming up with 6 stamp sets being offered at savings from 30-40% off... I just KNOW you'll want all the info when it comes out!